There were demonstrations and film shows in a marquee erected in the Monastery Garden. It was a good period for the small trader. 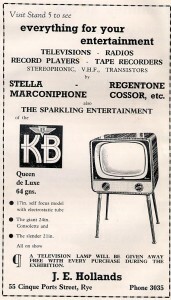 The war had been forgotten and there were new and exciting products becoming available to the general public for the first time. 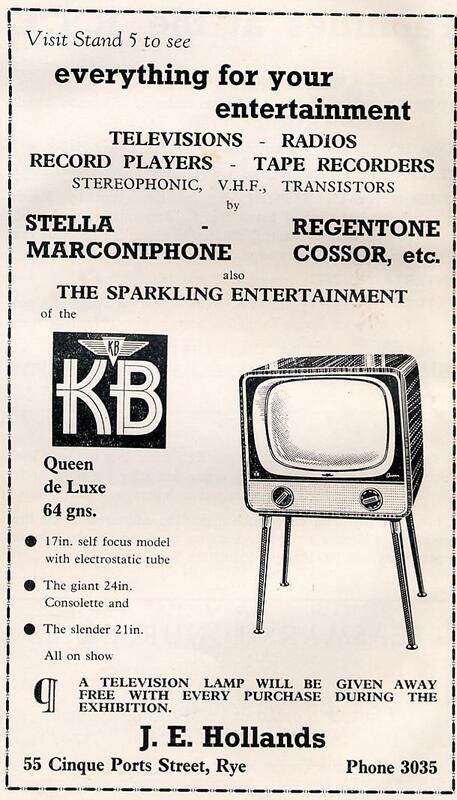 Television was just coming out of its infancy and prices were coming into the range of the ordinary working man. Soon almost every house in the land would have a television, and in Rye Jim Hollands had been a T.V. dealer for just one year when he took a stand at the Rye Trades Exhibition. It put him on the map. He was to go on to become the foremost single unit retailer in the country, so Ryers led the national trend. Soon families were crowding round their sets watching world events as they happened. A new age was born. Odell the Cycle man had a stand. Ernie Odell was the man in Rye for cycles. His business had started before the war and by this time he was established in a fine shop in Market Road. Jim Catt was his mechanic. Ernie was involved in many activities in the town – he was a keen member of the Bonfire Society and was the instigator of Odell’s Novelty Race at Rye Sports when anything on wheels could compete. There were prams, go carts and all manner of ingenious machines used for this event. 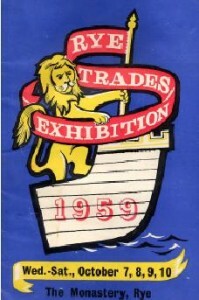 The 1959 Exhibition was held on the four days in October starting with the 7th. It finished up on Saturday. It opened each day at 2.30pm. and went on till ten at night. The 1959 Exhibition, organised by Rye Chamber of Trade, was opened by Mayor of Rye Alfred Horner accompanied by his wife, the Mayoress. Leading lights on the Committee were Mrs. R. Webb, Ernie Odell, Jim Foster and J. H. Daniels. Admission was One Shilling – Children under 16, sixpence with special concessions given to schools. There was an inquiry desk with its own telephone number, designated specially for the Exhibition. A Loud Speaker System was installed throughout by Messrs. Hollands & Son at Stand 5. Announcements of public interest, persons wanted, children lost etc. could be made without charge. Catering Buffet was by Messrs. A. Webb & Son (stand 14 upstairs) Open during Exhibition Hours. A Milk Bar run by the Milk Marketing Board could be found on their stand on the upper floor. Other exhibitors included, the East Kent Road Car Company Limited, who were concentrating on promoting British and Continental Holiday Tours and coach travel by the “Europa-bus” system. Rose-Anne (Mrs. M. Griffiths) took stand 12 and created quite a stir by having a selection of models parading round the Exhibition in “Lifelon” nylons. Jean Clark nee’ Paine (pictured left) at the Rose Anne stand was one of these lovely ladies. Rose- Annes is still going strong in Rye High Street, now run by Rosemary Griffiths. Another Rye Firm still going strong is Rye Pottery. 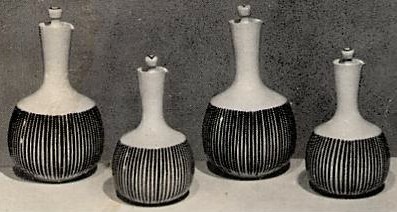 They exhibited their new design pottery on stand 13. The items displayed then are collectors items today. Deans Rag Book Company, the famous toy makers, had recently come to Rye and were an important exhibitor. They brought a lot of work to Rye and created an interesting stand that had the children enthralled. 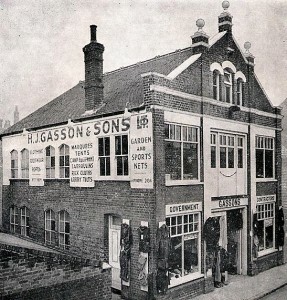 H. J. Gasson & Sons were sited in part of the marquee in the garden and displayed all kinds of Yachting and Farming equipment.